The exploration history of the U.S. offshore oil and natural gas industry began in the Pacific Ocean at the end of the 19th century. As recently as 1947 no company had ever risked drilling beyond the sight of land. Many of the earliest offshore oil wells were drilled from piers at Summerland in Santa Barbara County, California. Circa 1901 photo by G.H. Eldridge courtesy National Oceanic & Atmospheric Administration. In 1896, as enterprising businessmen pursued California’s prolific Summerland oilfield all the way to the beach, the lure of offshore production enticed Henry L. Williams and his associates to build a pier 300 feet out into the Pacific – and mount a standard cable-tool rig on it. Although never built, Thomas Rowland’s 1869 design for an offshore platform was far ahead of its time. By 1897 this first offshore well was producing oil and 22 companies soon joined in the boom, constructing 14 more piers and over 400 wells within the next five years. The Summerland offshore field produced for 25 years – fueling the growth of California’s economy. In 1894, Henry Williams drilled two wells on a California beach. He drilled another in 1895 with encouraging results. This led Williams and others to exploring for oil offshore the next year. In 1911, Gulf Refining Company abandoned the use of piers. It drilled Ferry Lake No. 1 on Caddo Lake, Louisiana, using a fleet of tugboats, barges, and floating pile drivers. When the well came in at 450 barrels per day, Gulf constructed platforms every 600 feet on each 10-acre lakebed site. Cable-tool derricks on Louisiana’s Caddo Lake, circa 1911. The Caddo Lake wells – completed over water without a pier connection to shore – have frequently been called America’s first true offshore drilling. A major petroleum company based in Pittsburgh, Pennsylvaniam drilled the first “over water” oil well in 1911, according to historian Bob Bowman of the East Texas Historical Association. “In the early l900s, 27-year-old Walter B. Pyron, of Blossom, Texas, a production foreman for Guffy Oil Company, noticed gas bubbles rising from Caddo Lake,” Bowman explains. “He and other Guffy employees rowed across the lake, lighting strings of the bubbles”. “In early May, 1911, after months of hard work and battles with mosquitoes, alligators and moccasins, the Ferry Lake No. 1 was drilled to a depth of 2,185 and began producing 450 barrels of oil a day,” reports Bowman.Pyron convinced his superiors at Gulf Oil Corporation – the successor of Guffy Petroleum Company – to drill on the lake. Derricks on Grand Lake St. Marys in Ohio, circa 1890s. Photograph courtesy of Joyce L. Alig, from the Mercer County Historical Society, Inc., Celina, Ohio. However, Ohio oil documents record hundreds of oil wells pumping far out into a lake – 20 years before drillers ventured into the waters of Caddo Lake. As early as 1891, the first submerged oil wells were drilled from platforms built on piles in Grand Lake St. Marys in Ohio, notes historian Judith L. Sneed in “The First Over Water Drilling: The Lost History Of Ohio’s Grand Reservoir Oil Boom.” Learn more in Ohio Offshore Wells. Even earlier, some historians say the true beginning of the modern offshore industry can be traced to an 1869 U.S. patent. Thomas Fitch Rowland of Greenpoint, New York, patented a “submarine drilling apparatus” on May 4, 1869. Rowland’s design included a fixed, working platform for drilling offshore to a depth of almost 50 feet. The anchored, four-legged tower – with telescoping legs “suitable hydraulic attachments or devices” – resembles modern offshore platforms. Learn more about An 1869 Offshore Rig Patent. Modern offshore structures include (from left to right): 1 and 2 are conventional fixed platforms; 3 is a compliant tower; 4 and 5 are vertically moored tension leg and mini-tension leg platforms; 6 is a spar platform; 7 and 8 are semi-submersibles; 9 is a floating production and offloading facility; 10) sub-sea completion and tie-back to host facility. In 1938, Pure Oil and Superior Oil Company built a freestanding drilling platform in the Gulf of Mexico – despite many logistics, engineering and communications challenges. They hired a Houston engineering and construction company, Brown & Root Marine Operators to build a 320-foot by 180-foot freestanding wooden deck in 14-feet of water about a mile offshore. The chosen drilling site was near Creole, Louisiana. Using onshore building criteria and intuition, the Creole platform was designed to withstand winds of 150 mph and constructed 15 feet above the water. Three hundred treated yellow pine pilings were driven 14 feet into the sandy bottom. The Superior-Pure State No. 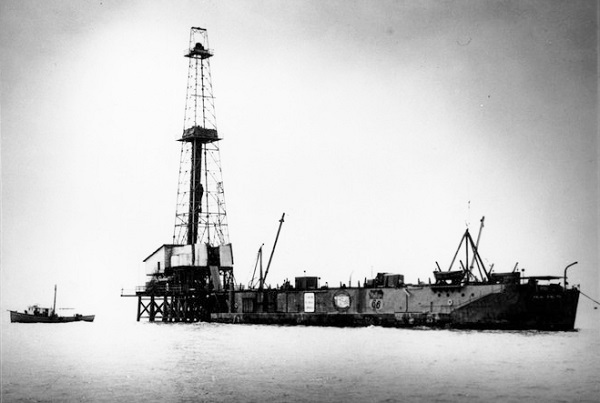 1 well was successful – but was wiped off its pilings by a hurricane in 1940. The platform was quickly rebuilt and put back into production in the four million barrel field. Onshore salt domes were recorded as early as 1890 by the Geological Survey of Texas. Kerr-McGee dramatically answered the salt dome question in 1947 with an experimental offshore rig. Not much equipment specifically designed for offshore drilling existed and exploration remained an extraordinarily speculative and risky business venture. An offshore dry hole could easily swallow the huge capital costs sunk into construction of a large, permanent rig platforms. This Kerr-McGee drilling platform, known as Kermac Rig No. 16, was the first offshore rig in the Gulf of Mexico that was out of sight of land. Photo courtesy New Orleans Times-Picayune. Nevertheless, Dean McGee of Kerr-McGee Oil Industries Inc. partnered with Phillips Petroleum and Stanolind Oil & Gas Co. to secure leases for exploratory wells in the Gulf of Mexico. They hired Brown & Root to build a freestanding platform 10 miles out to sea. “We decided to explore the areas where the really potential prolific production might be – salt domes – the good ones on land were gone, but we could move out in the shallow water and, in effect, get into a virgin area where we could find the real class-one type salt dome prospect,” McGee said. Vessels were needed to provide supplies, equipment, and crew quarters for the drilling site, 43 miles southwest of Morgan City, Louisiana. The gradually sloping Gulf of Mexico reached only about 18-feet deep at the drilling site. A second platform would be built about eight miles from the first at Ship Shoal Block 28. Sixteen 24-inch pilings were sunk 104 feet into the ocean floor to secure a 2,700 square foot wooden deck. The Kermac No. 16 well stood in almost 20 feet of water, 10 miles at sea. The well was spudded on September 10, 1947. The biggest hurricane of the season arrived a week later – with winds of 140 mph. Kerr-McGee had $450,000 invested in the project. Both platforms were evacuated during the hurricane, but damage was minimal. Drilling promptly resumed. On Nov.14, the Kermac No. 16 well came in at 40 barrels per hour. “Spectacular Gulf of Mexico Discovery. Possible 100-Million Barrel Field – 10 Miles at Sea,” proclaimed the Oil & Gas Journal. Kermac No.16 would produce 1.4 million barrels of oil and 307 million cubic feet of natural gas by 1984. Studies show that offshore platforms attract – and significantly increase – the numbers and species of fish. Today, 75 percent of recreational fishing trips off Louisiana visit one or more rig sites. Photo courtesy Pensacola Fishing Forum. By the end of 1949, 11 oil and natural gas fields were found in the Gulf of Mexico with 44 exploratory wells, according to the National Ocean Industries Association, which notes that the industry continued to through the 1950s. Modern offshore energy industry benefits come from the hard lessons learned from 60 years of open water experience. The Troll A natural gas platform, today operated by Statoil, in 1996 was not only “among the largest and most complex engineering projects in history,” it was “the largest object ever to be moved by man across the surface of the Earth.” Photo courtesy Amusing Planet. Compared to the limits of just a few years ago, today’s achievements will no doubt pale in comparison to what the future of offshore exploration will bring. Revenue generated from the production of oil became the second-largest revenue generator for the country, after income taxes. But deeper wells mean higher costs – and far greater technical challenges. The first use of helicopters offshore was at the request of Kerr-McGee and Humble Oil. Bell Helicopters soon formed Petroleum Bell Helicopters Co., which ran this ad in U.S. News and World Report on November 12, 1954. At right is a Bell Helicopter advertisement from 1954, courtesy the Ocean Star Offshore Drilling Rig and Museum. A flat area on an LST (from WW Two’s landing ship, tanks) anchored next to Humble Rig 28 served as landing pad for one of the first helicopters to be flown offshore. Today, helicopters are a common way for getting crews to and from offshore platforms. Constructed on land, as components of an offshore rig are completed, they are shipped to the drilling location. Sometimes assembly takes place as the rig is being transported to its intended destination. In addition, more scientists now recognize the role of petroleum platforms as artificial marine habitats. Whether placed as an artificial reef or a working (producing petroleum) structure, studies have been found rigs to increase the algae and invertebrates that attract – and significantly increase – numbers and species of fish. Learn more in Rigs to Reefs. Also see related articles, Deep Sea Roughnecks and Swimming Wrenches (a history of remotely operated undersea vehicles). A “big fin” squid 1.5 miles underwater. On November 11, 2007, a mile and a half underwater, a petroleum company’s remote control submersible camera captured a rarely seen Magnapinna squid. The brief video, obtained by National Geographic News, shows the alien-like squid loiter above the seafloor in the Gulf of Mexico. The clip – from Shell Oil Company’s Perdido production site – marks the first sighting of a Magnapinna or “big fin” squid near oil development. Marine biologists now partner with petroleum companies. Gulf of Mexico oil production is estimated to increase to record high levels in 2017, according to the Energy Information Administration. Gulf of Mexico federal offshore oil production accounts for 17 percent of total U.S. oil production; federal offshore natural gas production in the Gulf accounts for 5 percent of total U.S. dry production. More than 45 percent of total U.S. petroleum refining capacity is located along the Gulf coast, as well as 51 percent of total U.S. natural gas processing plant capacity. To meet increasing U.S. demand while addressing environmental concerns, new technologies have resulted in drilling rigs capable of drilling 250 miles offshore to ocean depths exceeding 10,000 feet. At stake are an additional 19 billion barrels of oil and another 86 trillion cubic feet of gas. But the risk of oil spills remains. About 5,000 offshore oil and natural gas platforms operate in the Gulf of Mexico around the clock, seven-days a week. It is the largest artificial reef system in the world. According to the National Academy of Sciences, more than 60 percent of all oil found in seawater is not from wells, but from natural seepage (the largest emitting 1,000 barrels of oil a week); 32 percent comes from shipping and run-off from land. Four percent can be attributed to tanker spills. However, near Santa Barbara, Calif., offshore drilling’s worst environmental disaster occurred in 1969 when an undersea well blew out. The calamity quickly brought industry changes that have protected the offshore environment ever since. Between 1980 and 1999, about 7.4 billion barrels of oil were produced in federal waters, says the U.S. Coast Guard. Less than a thousandth of one percent spilled – less than the natural seepage of oil from the sea floor. AOGHS.org welcomes sponsors to help us preserve petroleum history. Please support this energy education website with a donation today. Contact bawells@aoghs.org for information on levels and types of available sponsorships. © 2018 AOGHS.